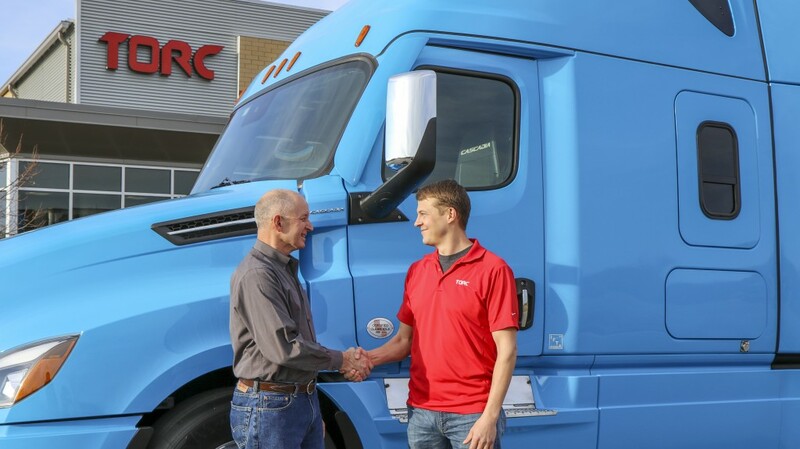 Michael Fleming, CEO of Torc Robotics, Martin Daum, Member of the Board of Management Daimler AG, responsible for Trucks and Buses, and Roger Nielsen, CEO of Daimler Trucks North America LLC, announced the strategic move at Torc headquarters in Blacksburg, Virginia. "Bringing Torc Robotics within the Daimler Trucks family creates a unique and powerful team of innovators to put highly automated trucks on the road. Daimler Trucks and Torc Robotics complement each other perfectly in terms of resources, expertise, and skill sets. We are forming the ideal combination between Torc's expertise on agile software development and our experience in delivering reliable and safe truck hardware," said Martin Daum, Member of the Board of Management Daimler AG, responsible for Trucks and Buses. "Together, we will provide a sustainable way for our customers to meet the ever-growing freight demand and benefit both the economy and society," he said. "Torc is not a start-up, but one of the world's most experienced companies for vehicle automation. Torc takes a practical approach to commercialization and offers advanced, road-ready technology, plus years of experience in heavy vehicles. Torc's Level 4 system has been shown to operate well for both urban and highway driving in rain, snow, fog, and sunshine," said Roger Nielsen, CEO of Daimler Trucks North America (DTNA), which includes the market-leading Freightliner brand. As part of the overall agreements, the Torc team will work closely with Daimler Trucks' developers, particularly with the Research & Development team of Daimler Trucks North America in Portland, Oregon. Torc will continue to develop its Asimov self-driving software and testing at its Blacksburg facility. At the same time, DTNA will focus on further evolving automated driving technology and vehicle integration for heavy-duty trucks at its Automated Truck Research & Development Center in Portland. The DTNA team is working on a truck chassis perfectly suited for automated driving, particularly the redundancy of systems needed to provide the maximum level of reliability and safety. Daimler Trucks is the pioneer of truck automation. Its global business includes not only Daimler AG in Germany, but other companies worldwide, including Daimler Trucks North America LLC in the U.S. In 2014, the world's leading truck manufacturer presented the Mercedes-Benz Future Truck 2025, the world's first automated truck, and was the first to demonstrate the technological opportunities and great potential that automated trucks offer the economy and society. In 2015, Daimler's Freightliner Inspiration Truck obtained the first-ever road license for a partially automated commercial vehicle and the world premiere of the Mercedes-Benz Actros with Highway Pilot took place on public roads.